A new report shows public transit ridership in Iowa grew 5% between 2007 and 2008. 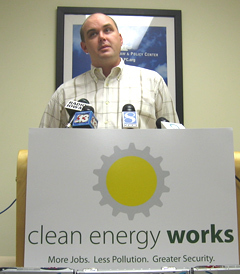 Eric Nost is with Environment Iowa, which released the report today. Nost says the energy savings from Iowans using public transit were equal to the amount of gasoline consumed by 15,300 vehicles or nearly nine-million gallons of gas. The report claims the fuel savings reduced global warming pollution by 80,000 tons. Andrew Snow, campaign director at the Environmental Law and Policy Center, says the record ridership should encourage lawmakers to increase funding for public transportation, rather than building new highways. “In a time when there are serious constraints on our state budget, investing in public transit and rail systems is a very cost effective investment that helps create economic development opportunities and increases the quality of living for all Iowans,” Snow said. The report says Iowans drove just over two-million fewer miles in 2008, which represents an 8% drop from 2007. Snow says the unprecedented demand for public transit should be met with a boost in funding for both high-speed rail and bus services. Micki Sandquist, executive director of the American Lung Association in Iowa, says reducing the number of cars on the roads will also reduce air pollution. She says a recent report graded 19 Iowa counties on air pollution. Clinton and Harrison Counties were each given a “D” for high ozone days, while Clinton, Johnson, Muscatine and Scott Counties were given an “F” for particle pollution. “We need to turn these grades around and mass transit is one way for Iowa to get there,” Sandquist said.